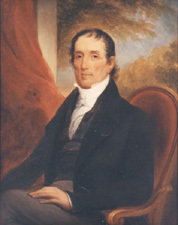 DESTRÉHAN, Jean Noel, a Senator from Louisiana; born in 1754 in that section of Louisiana which became the St. Charles Parish; engaged in mercantile pursuits and as a planter; member, legislative council of the Territory of Orleans and served as its president in 1806 and 1811; although opposed to the admission of the Territory to statehood, was a delegate to the convention and helped to draft the State constitution; member, State senate 1812-1817; upon the admission of Louisiana as a State into the Union was elected to the United States Senate on September 3, 1812, but resigned on October 1, 1812, without having qualified; resumed his former occupation as a planter; died in 1823; interment near Destréhan, La. Harvey, Horace H., Katherine Harvey Roger, and Louise Déstrehen Roger DOliveira. To Reach Afar: Memoirs and Biography of the Destréhan and Harvey Families of Louisiana. Clearwater, FL: Hercules Publishing Co., 1974.